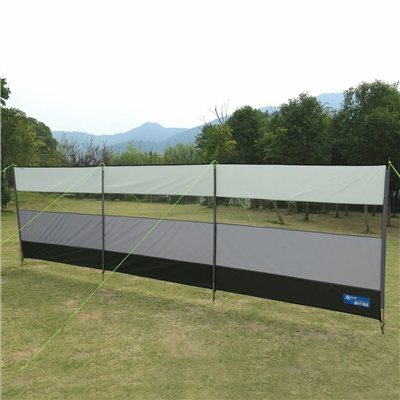 The Kampa windbreak is an excellent accessory for any camping trip. The colour coordinated wind break from Kampa is designed to match the colour range of Kampa tents while maintaining great durability and quality. The windbreak really does what it says and is a brilliant shelter from the wind. The clear horizontal panel ensures you don’t have to compromise a great view for protection from the wind – with the Kampa windbreak you can have the best of both worlds! The windbreak is extremely simple to use you just thread the poles through the sleeves, push the poles into the ground, attach and peg down the guy ropes and your windbreak is ready to use! erected this for the first time on our trip to Pevensey where the wind usually blows quite strong and it did, the Kampa break took the wind in it's stride and gave no prolems. superb piece of kit. After finding this in local store but not wanting to buy at the price I found it about 45% lower price here at Campingworld even with transport to Iceland. Really good value windbreak. Easy to put up. Had it by the coast in 20-40mph winds and it stood up fine. The see through panel is also really useful.